If you are a patriotically minded coin collector (and really, who isn’t? ), no doubt you have begun to gather up all those remarkable America The Beautiful Quarters as a must-have component of your collection. No other coin series has ever captured, nor celebrated, the wonder and majesty of America’s National Parks like these. Their astounding popularity has added scores of new enthusiasts to the ranks of coin collectors, and all anxiously await each and every new commemorative issue. For those not yet familiar with these coins, the America The Beautiful Quarters are a series of quarters created by the U.S. Mint, and were first put in circulation in 2010. The program is planned to continue until 2021, at the earliest, and could be extended to 2033, depending on the Secretary of the Treasury’s decision to extend the coin production further.. The obverse of each coin portrays George Washington, done in a reinstated edition of the original likeness used for the first-struck Washington Quarter back in 1932, which was designed by sculptor John Flanagan. Five new reverse designs are created each year, and each portray a national park or national site. There will be a selection made for each state, the District of Columbia, and each of the country’s five territories. The program was officially mandated by the America’s Beautiful National Parks Quarter Dollar Coin Act of 2008. The Quarters will be minted illustrating the national parks and national sites in the order of which that park or site was designated as a national landmark. The quarters from the four states that represented parks or sites formerly portrayed on the State Quarters include Grand Canyon in Arizona, Yosemite in California, White Mountains in New Hampshire, and Mount Rushmore in South Dakota. The new National Park Quarters for these sites will show the same locations, but they will have newer designs. The Hot Springs National Park Quarter was the first to be issued because it was granted federal protection on April 20, 1832. The last coin to be issued, in 2021, will be the Tuskegee Airmen National Historic Site Quarter, which was established on November 6, 1998. Yosemite National Park Quarter – July 26, 2010. Gettysburg National Military Park Quarter – January 24, 2011. To keep these wonderful and historic coins safe for present and future generations, there are numerous coin holders available in which to protect and store them. 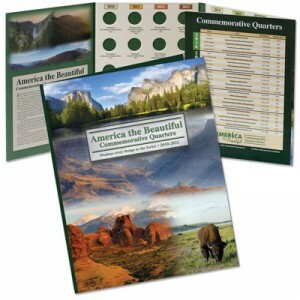 From vividly colored and designed National Park Quarter Maps and National Park Quarter folders to National Park Quarter albums. There are also selections like the classy Lighthouse Albums to the vibrant Littleton Quarter Maps, and all are the perfect showcase for your National Park Quarter collections. They will make all the difference in the world when it comes to safety and security, and will provide a life-time of not only extraordinary historical reference and educational value for these coins, but they are an ideal way to display the once-in-a-generation collection of America The Beautiful National Park Quarters to friends and family. Whether it is for the beginning numismatist or the experienced collector, these National Park Quarter holders from major brands like Airtite, Cornerstone, H.E.Harris, Whitman, Lighthouse, Littleton, and Dansco will ensure any collection receives the utmost attention in a perfect visual display combined with quality preservation methods and archival materials. The National Park Quarter coin collection is an extremely valuable investment that anyone will want to cherish for years to come.